Benjamin Watson (born December 18, 1980) is an American football tight end for the Baltimore Ravens of the National Football League (NFL). He was drafted by the New England Patriots 32nd overall in the 2004 NFL draft. He played college football at Georgia. Watson has also played for the Cleveland Browns and New Orleans Saints. Watson attended Northwestern High School in Rock Hill, South Carolina, and was a letterman in football and track. In football, as a senior, he caught 31 passes for 515 yards. The two-time All-Region selection and Northwestern HS Student of the Year led his team to the state championship in his junior season. He was also a member of his high school chapter of The Fellowship of Christian Athletes. Watson entered the league after scoring a 48 on his Wonderlic Test. That is tied for third highest score ever in the NFL. 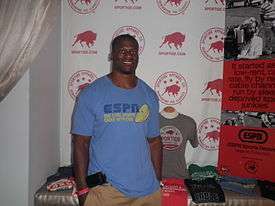 He was drafted by the New England Patriots 32nd overall in the 2004 NFL draft. He was on the injured list for almost his entire rookie season for the Patriots, playing in only one game. Watson received a Super Bowl ring following the Patriots' win over the Eagles in Super Bowl XXXIX. He continued to battle injuries throughout his stint in New England, starting just 47 games in six seasons with the team. He nabbed a career-best six touchdown passes in the Patriots' undefeated 2007 campaign, third best on the team. On March 12, 2010, Watson signed a three-year deal with the Cleveland Browns, reuniting him with former Patriots assistant coach, Eric Mangini. In the 2010 season, Watson led the Browns in receptions, receiving yards, and receiving touchdowns (tied with Brian Robiskie). On March 18, 2013, Watson agreed to terms on a three-year contract with the New Orleans Saints. In 2015 he was elected as one of the offensive team captains (along with Drew Brees and Zach Strief). In Week 6, he had a solid performance, catching 10 passes for 127 yards and a touchdown as the Saints beat the undefeated Atlanta in a nationally televised Thursday Night Football game. In a Week 8 game against the New York Giants, Watson caught 9 passes for 147 yards and a touchdown, easily besting his previous performance against the Falcons. At the conclusion of the 2015 campaign, Watson was recognized as one of three finalists (Eli Manning and Anquan Boldin) for the Walter Payton Man-of-the-Year award, which was won by Boldin. As well as being named a Pro Bowl Alternate. Watson was also one of five finalists for the NFLPA's Whizzer White Man of the Year award. On March 9, 2016, Watson signed a 2-year contract with the Baltimore Ravens worth $7 million with $3 million guaranteed until 2018. On August 27, 2016, during the Ravens' third preseason game, he suffered a torn Achilles tendon, ending his season. Watson is married to Kirsten Vaughn Watson, who grew up in Baton Rouge. Vaughn was a multisport athlete at Episcopal. Her grandfather, Isaac Greggs, was the longtime band director at Southern. Her father Percy Vaughn, is from New Orleans and a Southern University graduate. Her mom, Audree, attended Louisiana State University. 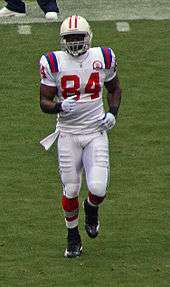 Vaughn and Watson married in 2005 after his rookie NFL year. Together they have children: twin daughters Grace and Naomi, sons Isaiah and Judah (March 19, 2013), and daughter Eden (August 15, 2015). Watson is a devout Christian who is known for being outspoken about his faith. Benjamin has a younger brother, Asa, who was signed by the New England Patriots on May 10, 2014. On November 17, 2015, Benjamin Watson released a book, "Under Our Skin: Getting Real About Race--And Getting Free From the Fears and Frustrations That Divide Us" with Tyndale House Publishers. ↑ "Benjamin Watson". nfldraftscout.com. Retrieved September 10, 2016. ↑ Katherine Terrell, "New Orleans Saints vote three new captains for 2015 season", The Times-Picayune, September 10, 2015. ↑ "Ravens Agree To Deal With TE Benjamin Watson". www.baltimoreravens.com. Retrieved 2016-03-10. ↑ Spotrac.com. "Benjamin Watson". Spotrac.com. Retrieved 2016-03-10. ↑ Orr, Conor (August 27, 2016). "Ravens' Ben Watson out for season with torn Achilles". NFL.com. Retrieved August 28, 2016. 1 2 3 "watson family". ↑ "For Saints tight end Watson, family, faith come first". ↑ "Unpackin' It — Benjamin Watson".